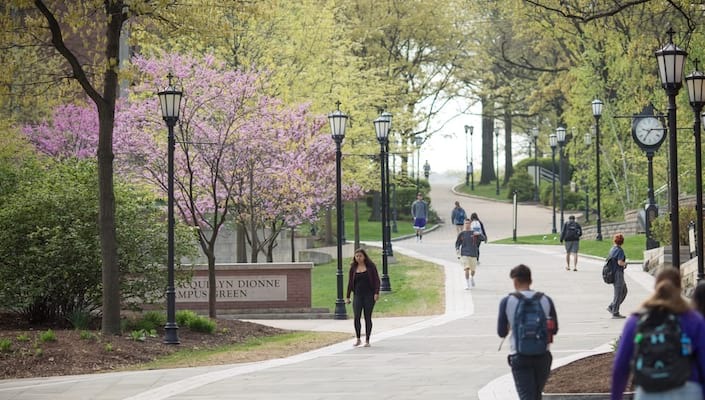 The Princeton Review chose The University of Scranton for many of its more coveted – but often less publicized – “Best Colleges” lists including “Best Science Labs” (No. 8), “Best Campus Food” (No. 11), “Best College Dorms” (No. 16) and “Students Love These Colleges” (No. 19). Scranton is once again listed among Princeton Review’s “The Best 380 Colleges,” marking the 14th consecutive year that the University has been included in the annual guidebook. In recent years, Scranton has invested more than $200 million in campus improvements, either completed or under way. These capital projects include the DeNaples Center, Dionne Campus Green and Condron, Pilarz and Montrone Halls, which house more than 750 students. Dedicated in 2012, Scranton’s $85 million Loyola Science Center is one of the most innovative science buildings in the country. The 200,000-square-foot center is the culmination of more than 15 years of planning. A new $47.5 million center for rehabilitation education is scheduled to open for the fall 2015 semester. The 2016 edition of the college guidebook became available on Aug. 4. Last month, Forbes and The Center for College Affordability and Productivity ranked the University No. 240 among the 650 universities included in a listing of “America’s Top Colleges 2015,” and MONEY magazine ranked the University No. 167 of the 736 colleges listed in its “Best Colleges for your Money” publication.